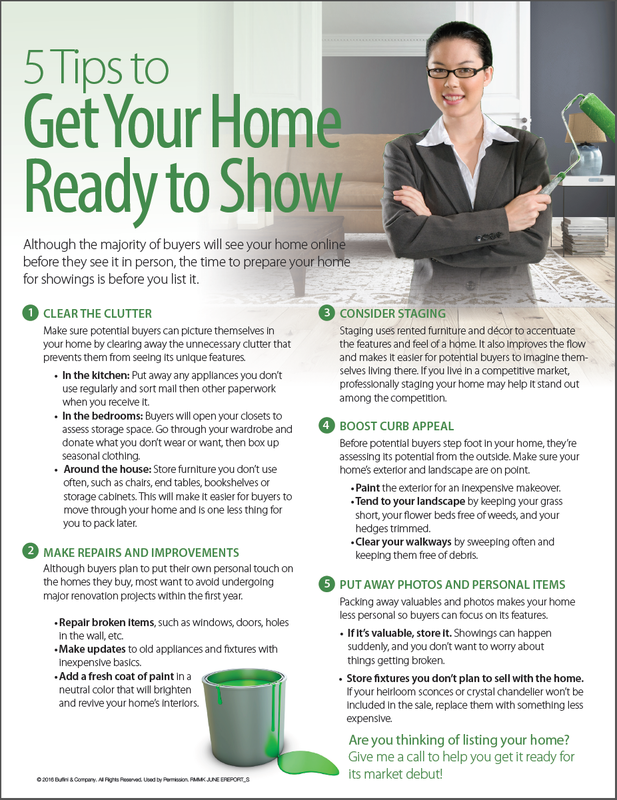 Although the majority of buyers will see your home online before they see it in person, the time to prepare your home for showings is before you list it. Make sure potential buyers can picture themselves in your home by clearing away the unnecessary clutter that prevents them from seeing its unique features. In the bedrooms: Buyers will open your closets to assess storage space. Go through your wardrobe and donate what you don’t wear or want, then box up seasonal clothing. Around the house: Store furniture you don’t use often, such as chairs, end tables, bookshelves or storage cabinets. This will make it easier for buyers to move through your home and is one less thing for you to pack later. Although buyers plan to put their own personal touch on the homes they buy, most want to avoid undergoing major renovation projects within the first year. Repair broken items, such as windows, doors, holes in the wall, etc. Make updates to old appliances and fixtures with inexpensive basics. Add a fresh coat of paint in a neutral color that will brighten and revive your home’s interiors. Staging uses rented furniture and décor to accentuate the features and feel of a home. It also improves the flow and makes it easier for potential buyers to imagine themselves living there. If you live in a competitive market, professionally staging your home may help it stand out among the competition. Before potential buyers step foot in your home, they’re assessing its potential from the outside. Make sure your home’s exterior and landscape are on point. Paint the exterior for an inexpensive makeover. Tend to your landscape by keeping your grass short, your flower beds free of weeds, and your hedges trimmed. Clear your walkways by sweeping often and keeping them free of debris. Packing away valuables and photos makes your home less personal so buyers can focus on its features. If it’s valuable, store it. Showings can happen suddenly, and you don’t want to worry about things getting broken. Store fixtures you don’t plan to sell with the home. If your heirloom sconces or crystal chandelier won’t be included in the sale, replace them with something less expensive. Are you thinking of listing your home? Give us a call to help you get it ready for its market debut!